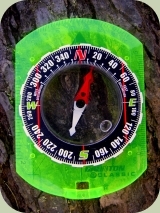 Understanding how to read a compass properly is a vital outdoor skill. Using a compass is a fundamental way to help you determine your location and direction of travel. It is also important to understand what a compass does and what it does not do. The Compass Body or Housing: This houses the movable parts of the compass. Direction-of-travel Arrow: An arrow painted on outside the compass that you can use to aid in directional travel. Orienting Arrow: A fixed arrow usually painted underneath the movable parts of the compass. Compass Needle: The movable part of the compass that follows the earth's magnetic pull. There are two types of North, and understanding this is vital in knowing how to read a compass. True North is located at the North Pole, which is the point in the Arctic Sea around which the earth rotates. The Magnetic North, however, is located in a different location, in northern Canada. This location actually changes with time. The earth is covered in magnetic lines that come out of the Magnetic South, cover the planet, and converge again at the Magnetic North. To understand Magnetic North, you need to understand that those lines are generally not straight, and in some parts of the country they point pretty far from True North. That variance between the True North and Magnetic North is called magnetic variation or declination. When you are learning how to read a compass, you must take this variance into account. This variance is given as a number in units of degrees, based on the 360 degrees in a circle. Depending on where in the northern hemisphere you live, this number might be east or west of True North. Many modern compasses have numbers printed on them for ease of reading. Modern topographic maps include the declination number on them. You can also visit NOAA's Geophysical Data Center online to learn what the declination is for your area. Find out what declination is for your area and keep this number with you. You might even want to write a note on a piece of paper and leave it inside your compass container or write it directly on your compass. Remember to check it at least every few years, as it can change with time. Look carefully at your compass, and make sure there are no metal or magnetic objects near it when you do (they can skew your compass readings). Place the compass so that North is at the top of the circle. Now use the numbers of declination and rotate the compass slowly until you are the correct number of degrees away from the magnetic North to point to True North. Remember that North on a map is calibrated to True North. So when using your compass along with a map, remember to adjust for the declination or difference. One way to help you learn how to read a compass is to play a simple game of taking compass bearings of objects in your surrounding area. A compass bearing is the number of degrees between an object and the north on your compass. Try this by standing with your compass in your palm at about waist height. Now, point the fixed direction-of-travel arrow at an object or landmark. Then, twist the compass housing so the compass needle lies right over the orienting arrow. Make sure that the compass needle is pointing North at the top of the housing. Finally, read the number on the rim of the compass. That is the bearing of the landmark – the number of degrees it is from Magnetic North. For more practice or assistance in learning how to read a compass, you can check out a navigation book from the library or visit with a local orienteering club.